We are in the beginning of the 19th century. The Napoleonic wars are coming to an end and young Talbot has joined a heterogeneous crowd of émigrés on board of an old decommissioned warship, for a long voyage to Australia where he is up to become an important man in the administration. 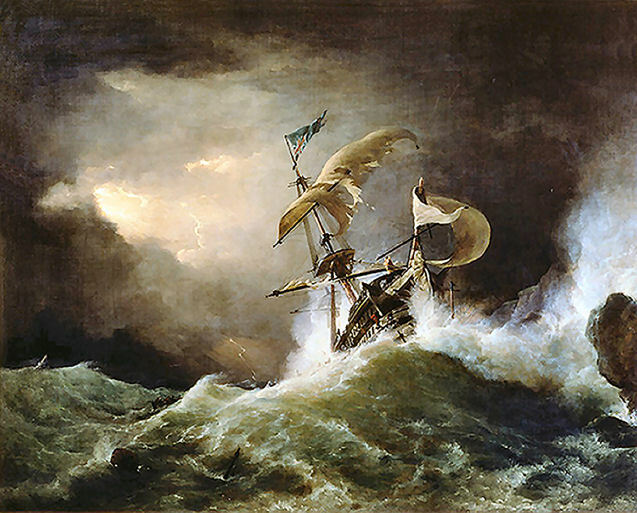 Talbot has promised his Godfather and sponsor to keep a detailed journal and although he very consciously begins with a detailed narration of what happens around him, the gale that awaits them at the entrance of the Gulf of Biscay and the ensuing “mal de mer” rapidly mocks his good intentions. Edmund starts messing up the dates in his journal, totally loses his sense of time and awkwardly tries to maintain his aristocratic “aplomb” on the heaving and tilted deck awash with overcoming seas. But he is not alone in his suffering. The uncomfortable progress of the ship beating its way through the storm mirrors the emotional upheaval of all Talbots co-passengers. Through his observations, we recognize in Talbot the typical naïve, albeit engaging young man from a higher class, observing with a detached and aloof superiority the microcosm around him but at the same time totally estranged from reality, from all practical things and the normal ways of the world. For instance when he discovers the small stinking hutch in which he will have to live the next months, he insists to see the Captain to request a change of lodging. Of course the Captain has absolutely no time for him as the reader half expects. Rites of Passage, published in 1980 earned Golding his Booker prize, barely beating Anthony Burgess’s masterpiece “Earthly Powers”. One critic saw in it “the work of the master at the full stretch of his age and wisdom”. The 69 year old author was surfing on a wave of fame and recognition, which would cumulate three years later in the Nobel Prize. Still, it took the seasoned writer quiet a lot of work to finish his book and it necessitated four full drafts before Golding finally consented to send it to Faber & Faber. Edmund, our friendly narrator resembles those typical heroes of German “bildung romans”, not much different in his ways from Mann’s Hans Castorp or Goethe’s Wilhem Meister, young men about to experience such life-lessons as to bring them to a higher level of understanding of life and humans actions. And so it is with Talbot. Occurrences linked to the death of the reverend Colley, a fellow passenger, following “shameful actions” during the equator - crossing ritual, make up a horrific rite of passage which Talbot’s unconsciously passes. The moral responsibility, which Talbot will acquire from this “nasty” experience still has to sink in and he too after experiencing his “rite of passage” will carry his ”burden of shame”. Ironically, the alert reader can suspect that conspiring in this hypocritical attitude, to protect members of his social class, will give Talbot the moral edge to tackle the difficulties of his upcoming task as a higher civil servant. For even if the “moral education” has to be understood in a “a contrario” sense, a “Bildung” – experience it certainly is. Structurally complex, Rites of passage, is done very much “à la Golding”. Narrated first through Edmund’s journal addressing a peripheral personage, then followed by Colley’s letter to his sister, rephrasing and inverting the pages of Talbot’s journal, shifting abruptly the narrative point of view, this complex structure brings the reader to a whole new level of understanding and a deeper insight in the occurrences of what was first described in Talbot’s journal. This inverted perspective cleverly urges the reader to sit up and give attention. The letter which ends at the Parson’s death is followed by an interrogation with which the reader tries, unsuccessfully, to fill up the blanks in the understanding of what has happened (actually it brings even more confusion). The interrogation is promptly closed, when the enquiry unexpectedly risks implicating some officers. The book ends in some simmering gossip and a few afterthoughts trying to make sense of it all. This structure of this progressive insight is very successful in giving the reader a deeper understanding of the unfolding truths. Adding to the complexity, Golding spices his story with some loose ends, unexplained or half explained acts, conversations or personages. The mysterious purser, for instance, controlling his debtors from the heart of the ship does not belong to the story but adds to the general feeling that “things happen” in the shades of this old war ship. There is in fact, an entire subculture on the ship -- the crew and "the emigrants" -- that the reader is barely exposed to, since neither Edmund nor Reverend Colley would mix with them. One exception is Wheeler, Talbot’s self appointed valet and provider of the soothing opium, who is murdered for unexplained reasons by unidentified fellow crewmen, officers or why not…passengers. Not only is the structure of the book very much what we expect from Golding, but so are the themes which are, according to his biographer, James Carey, the one’s that most preoccupied him during his life. A first theme is of course that of “Shame” and how it defines who we are. How can the field of tension between our own perception of an experience and the perceived opinion of others about that same experience, lead not only to a feeling of shame but even to someone dying of shame? Golding shows us the complex mechanisms behind our behavior and emphasizes how human they are. Alas! Obviously all characters living on the middle deck (and being of the middleclass) are carrying their “burden of shame” and their identity is largely defined by it. It is as if these middleclass passengers are hoping to leave their identities behind them in their voyage to a new world. They hide their humble origins, their immoral occupations, their childhood horrors, the fact that they need to work to make a living and that they sleep with each other. They hide their sexual preferences, their lost battle to alcohol and their vacillating faith in the Almighty. Only Talbot, seems to carry a childish innocence at the beginning of the voyage. Still he has to go through his rite of passage and we suspect that he too, if he makes it to the antipodes, will have experienced things he regrets and feels ashamed of and that it could define part of his identity. I understand it as such: according to Golding, people are defined by what they do and what they don’t do. Shame or pride linger after the deeds have been internally analyzed and appreciated against the morality or expectations of one’s social class. According to his biographer, Golding, remained "revoltingly" dependent on what people thought of him and his work. Through his life, the author was coping with a nasty inferiority complex and self-depreciating attitude. We know that Golding’s early encounter with the academic establishment and the glass ceiling of the social classes left an indelible stain on his character. Maybe alcohol abuse, violence and flight were Golding’s only options to cope with his issues. Unfortunately after a brief spell of a liberating feeling, shame caught him back the next day like the backwash of a wave. Carey, who had access to Golding most private notes like his dream diary points out that Golding had the occasional – innocent – homosexual fantasies, but that it bothered him and made him question his sexual nature. Much of what happens in the forecastle to the Parson and the ensuing sense of shame comes right from the desires or un-desires of Golding himself. Another interesting theme is the analysis of responsibility in what happens to reverend Colley. Colley is an unattractive character. His over-eager attempts at friendship, his religious zeal and his personality turn him into an outcast from the moment he sets foot on deck. For Talbot the parson is a bit like a stray dog. He pities him but the other hand he refrains to show him sympathy because he realizes that the parson, will stick to him like a drowning man pulling his rescuer down. And the parson is too vile a character to be associated with, taking into account the difference of social class. The only one who could have saved the parson is Captain Anderson. But his despise of the robe in general and Colley in particular, sets an example to officers and crew alike and the reverend becomes a target for abuse. The Captain has the social status to reverse the flow of things but does not assume the responsibility which goes with it. We are often not aware when having power over other persons (as teachers, managers, parents, role models), what damage we can do by uttering opinionated biased statements or acting in inconsiderate ways.